Rum cake is a thing of beauty. Rich with butter, sweet and almost cloying but not quite and of course absolutely soaked with rum. Coconut Rum Cake is just a little bit more amazing. Full disclosure, this is a cake mix recipe. Everybody needs a few cake mix hacks in their pocket and this one is mine. If I served you a slice of this you would probably never guess I started with a mix. If you can,that is an amazing talent you should be getting paid for somewhere. Frankly, a quality cake mix dressed up to show off is a wonderful thing. It’s cheap, it’s easy and it has the potential to go toe to toe with homemade. Just make sure you start with a quality mix. I only buy Betty Crocker. I don’t work with the company or advertise for them in any way, I just like the cake mix. I have been using it exclusively for 13 years and I’m not going back. This recipe works well with the Golden Vanilla flavor mix. I think you are going to love the mere 15 minutes of work it takes to get this puppy on the table. Heck, it almost takes longer than that to order a pizza! Coconut Rum Cake is perfect at dinner parties, game nights, Christmas, New Years, and of course Easter. Where will you serve it first? 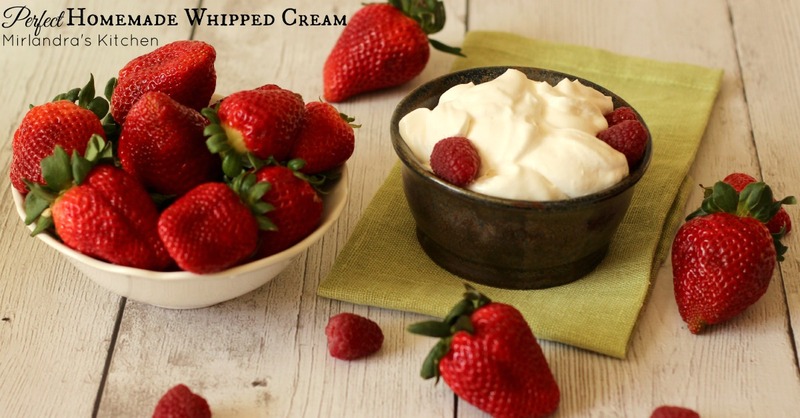 By the way, it goes great with homemade whipped cream – try my all time best recipe here. Preheat oven to 325 degrees F. Grease and flour a 10 inch Bundt pan. In a medium bowl, put cake mix and pudding mix, eggs, water, oil, coconut flavoring and 1/2 cup coconut rum. Whisk together briskly until well thoroughly mixed. Bake in the preheated oven for 45 - 50 minutes. The cake is done when a cake tester comes back clean. Let sit for 15 minutes in the pan. While the cake is resting, make the glaze. In a medium saucepan, combine butter, water, and brown sugar. Bring to a boil over medium heat and continue to boil for five minutes, stirring constantly. Remove the glaze from the stove and stir in the rum. Set aside. Gently slide a rubber spatula between the cake and the Bundt pan to ensure that it is loosened and will release easily. Carefully invert the cake onto a plate and pour 1/3 of the glaze into the Bundt pan. Slide the cake back off of the plate into the Bunt pan making sure to line up the pattern of the cake and pan correctly. Pour the rest of the glaze over the cake and allow to sit for one hour and absorb the glaze. Gently invert the wet cake back onto a plate and allow to sit for another hour or until the next day before serving. I bake with this Calphalon Bundt pan. I love how heavy duty it is AND that it is dishwasher safe. They make some great bake ware. Adapted from this Rum Cake recipe. Thanks, Sarah! I hope you enjoy it! I was in the same boat and finally bought one about six months ago. I have a modest sized kitchen and I try to only own what I really need and use but this one has turned out to be a lot of fun. Cake mix cakes are super practical for some applications and not everybody has the time or inclination to bake one from scratch. 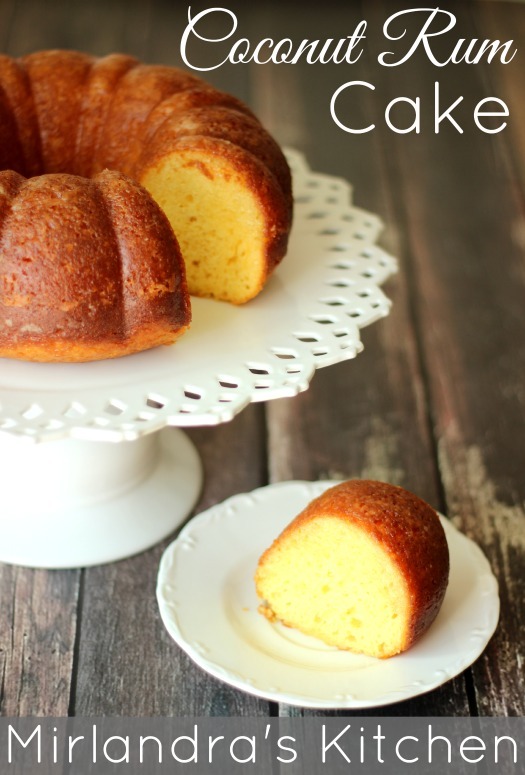 Besides, you can make something super yummy with a cake mix! That’s so right, I tried the Coconut Rum Cake using the vanilla cake mix it was perfect so delicious they all love it. I’m so glad you all enjoyed it! I can’t resist the delicious coconut flavor – ever! Happy baking! Oh this sounds good! My MIL makes a rum cakes every Christmas for and it is delicious! I’m giving her this recipe to try this holiday season…since I love coconut. Thank you for sharing. What kind of coconut rum do you use? Any particular brand? Thanks!!! I like both Whalers and Parrot Bay. This recipe is fine with a modest to mid-level costing rum. I would not go out of my way to make it with a high end variety! Has anyone put toasted coconut on top? I am in the process of making and will try this addition to a yummy looking recipe. What’s a coconut cake w/o it? It was the best cake ever, I took it to a party the next day (gave it a day to sit) and everyone loved it! Thanks for the recipe, it’s a keeper. My first batch came out excellent! But my second all shrunk tremendously!! I’m not sure what I did different! Any ideas? I’m so bummed! That is odd. The first few things I would look for in this case are measurement or cooking time. Often when I have a problem like that I find I left and ingredient out or forgot to set a timer and overcooked the cake. The other thing you might check is if your cake mix is expired? If it is just a few months out of date it is probably fine but if it is significantly expired it is possible that it won’t work as well. The only other thing that comes to mind is timing. With cakes if you make the batter up and let it sit for several hours sometimes you have cooking problems. With baking in general once the wet ingredients and the dry ingredients are mixed together you should bake right away. Sometimes cooking just goes wrong and we never figure out why! One time I was giving a girl cooking lessons right after she got married and she actually exploded corn bread in my oven. I still have NO idea what she did! I was right there helping and it is a total mystery. We still laugh about it though! Wow a friend brought back a bottle of coconut rum from managua didnt know what to do with it until I saw this recipe. Made it last night and it was a hit! I had a coconut rum guava cake in Nassau, Bahamas this past weekend. It was wonderful. Assume if I were to recreate using your recipe I’d use 8 oz of guava past mixed into the batter? By the way, I am gluten intolerant so I will be making it with the Betty Crocker Gluten Free Yellow Cake Mix which is 15 oz. Well, Mark, I’m not sure I will be much help here. I have not had a Coconut Rum Guava Cake and even if I had it could be totally different. I would caution you that if you add 8oz of anything to a cake mix you are at serious risk of the cake failing. With a GF cake mix that is even more likely. I think you might do better to search specifically for the type of recipe you want instead of changing this one. By all means try if if you like and let me know how it goes. I just want to warn you that it might take some tweaking to get it right 🙂 Good luck! Let me know how the experiment turns out!!! This looks yummy. Going to make it for Father’s Day. Just a question . . . Do I put the cake in the refrigerator or store at room temperature? Thanks! You can do either for the first few days. I usually leave mine on the counter for a few days if I have leftovers and after that if you still have leftovers the fridge is a good idea. I hope your father’s day was lovely! Sound very GOOD but can use the cake for a naked cake wedding? There is no reason you could not serve this cake at a wedding if you like. I don’t frost this – just serve it the way it is which is what I assume you mean by a naked cake. Good luck! Hi! Making this for Christmas next week. Do you think i can leave it out covered tightly with seran wrap on the counter for a week? This is not the kind of rum cake that benefits from sitting out that long. I think you might be better off to try to make it the day before if you can. You want it to sit long enough for soaking but not long enough to get stale. 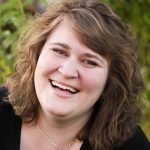 Sorry – I hope that does not ruin all of your Christmas baking plans! Would it work just as well with regular light rum? Has that been tried? Really wish I could pin this recipe!! There is no reason you can’t do it with light rum but you won’t get as much coconut flavor out of it. It would still be a fun rum cake! I’m sorry we did pull our old pin it button off the site because it was tanking speed and causing other problems. We are working to install a new one but want to make sure it is a high quality button that will not slow things down. A slow web page is no fun! Did you create/publish this recipe with the old 18 ounce cake mixes, or with the newer standard 15 oz. boxes? Congratulations on the forthcoming new arrival! I’ll be baking today and tasting tomorrow. I’m sure it will be fine. Thank you 🙂 I’m looking forward to hearing how it goes! Made the cake the day before, and served it last night. RAVE reviews!!!! The three of us could have eaten the entire cake ! My only change was that instead of the coconut flavoring, I substituted a half cup of coconut. The only thing I would do next time other than that, is something I do with my “plain “ rum cake, which is to put chopped pecans or walnuts in the bundt pan before pouring the batter. Last night it was served with vanilla ice cream with walnuts sprinkled on top. It was so-o-o-o good! Thank you!!! Hope your newborn lets you get back to cooking soon ! What is instant vanilla pudding mix?? Not sure we sell it in uk,what alternative should I use? ?does this cake reheat well in microwave to serve warm with ice cram?? 1. This is a simple recipe to make your own mix: https://www.friendshipbreadkitchen.com/vanilla-instant-pudding/ It tells you how much of the mix to use as a sub. I would not add the nutmeg but that is a personal choice since I’m not sure it would really work in this cake. It is an extra step but the ingredients look easy. 2. You could try making it without the pudding mix. I don’t love this idea but I think the cake would still be good, just different. Either way it is a bit of an experiment but I feel both options have potential. If you try one please let me know! I’m always excited to hear what options work for other people. I think the cake would reheat very well in the microwave. I would treat it like a pastry or doughnut – heat for 11-15 seconds at a time with the slice of cake covered. 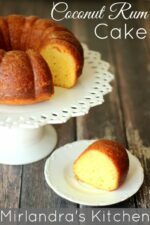 Does this cake recipe work well if using a regular round cake pan (not a bundt pan)? I’m making a groom’s cake for a wedding and the groom requested coconut rum cake. This cake sounds perfect! The cake would be in a 10 or 12″ round cake pan. It should be fine if you use two 10″ cake pans for a layer cake situation. I have not baked it that way but I would not anticipate any issues. Best of luck and let me know how it turns out!